The Petit Basset Griffon Vendéen is a small scent hound who has won the hearts of millions. Although the dog breed appears to be designed for winsome cuteness, in actuality, PBGVs are tough hunters who were developed for a specific purpose: to hunt small game in the rough terrain of the Vendeen region of France. The breed is known for a merry and outgoing personality. Bred in France to hunt small game such as rabbits, the name Petit Basset Griffon Vendeen means "small Basset with wiry hair from the Vendee district of France." Dating back to the 16th Century, this breed is an active Scenthound. An independent and over-confident breed, he's small with a large ego. This short, long-backed rabbit hunter is a merry soul who loves to dig and bark. He's terrific in performance sports like agility. The PGBV is charming, stubborn, active, and wildly enthusiastic about everything, especially you. He would rather hunt than come to you, though. PBGVs are charming and strong-headed. Consistent, patient training is essential. 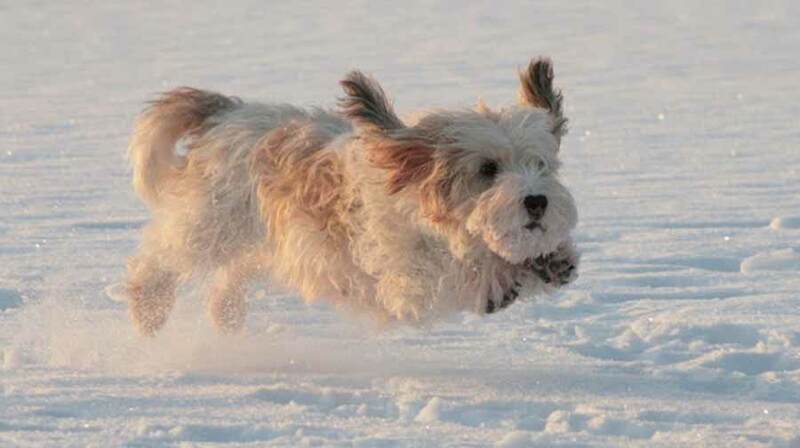 PBGVs can be stubborn and difficult to housebreak. Crate training is recommended. This breed likes to bark. Don't be surprised by the PBGV that has plenty to say. PBGVs have a lot of energy and stamina. They need exercise every day. They enjoy a good long walk, but don't turn them off leash because you never know when their hunting instincts will kick in. The nose rules! Like all hounds, the PBGV is driven by his nose. The PBGV is not related to the Basset Hound. He is lighter, smaller boned, and more active and agile. 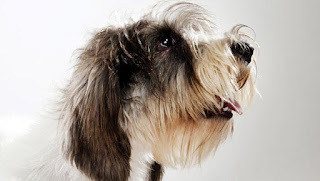 The PBGV is distinguished by a rough, unrefined outline and a head that is longer than it is wide. His face is protected from rough brush by a beard and mustache and long eyebrows help protect his large dark eyes. Taken together they give him an alert, friendly, intelligent expression. Long, narrow ears are covered with long hair and hang down, folding inward and ending in an oval shape. The medium-length tail has a slight curve and is carried like a saber. The coat is white with any combination of lemon, orange, black, sable, tricolor or grizzle markings, ensuring that he is easily seen in the field. 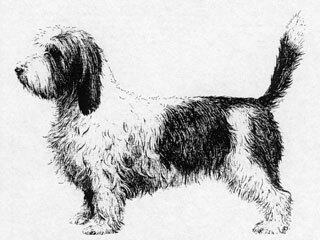 The PBGV is a French breed, one of many small varieties of French hounds that have existed for centuries. He descends from the larger Griffon Vendeen and dates to the 16th century. The area where he was developed — the Vendeen — was harsh country with thick underbrush, rocky ground, and thorns and brambles. To hunt it called for a bold, tough, determined dog with a lot of stamina and excellent hunting ability. French hunters developed different size dogs to hunt different types of prey. The PBGV was used to trail rabbit and hare and sometimes game birds. He is still a good hunting dog today. The Club du Basset Vendeen was formed in 1907. The first breed standard was written by Paul Dezamy, the club’s first president. The standard he wrote applied to both the PBGV and his big brother the Grand Basset Griffon Vendeen. 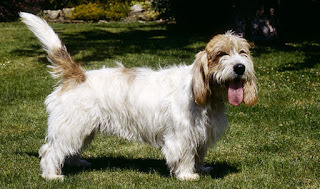 At the time, both sizes could be born in the same litter, and the dogs could be interbred until as late as 1975, although the PBGV did get his own standard in the 1950s. The Petit Basset Griffon Vendeen Club of America was founded in 1984 at the American Kennel Club Centennial Dog Show. The AKC recognized the breed in 1991. 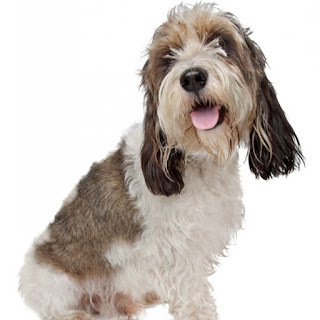 The PBGV ranks 129th among the dogs registered by the AKC. The Petit Bassset Griffon Vendeen, or PBGV as enthusiasts call them, are happy little dogs that are often chosen to be family companions. 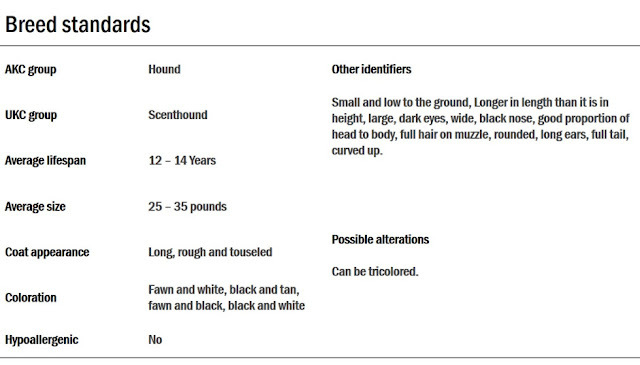 Don't let their size or the “Basset” in their name fool you. These little hound dogs are spark plugs – full of energy and a zest for life that isn't matched by many other hound breeds. PBGVs are curious dogs, always sniffing around the house or yard to see what kind of mischief he can get into. 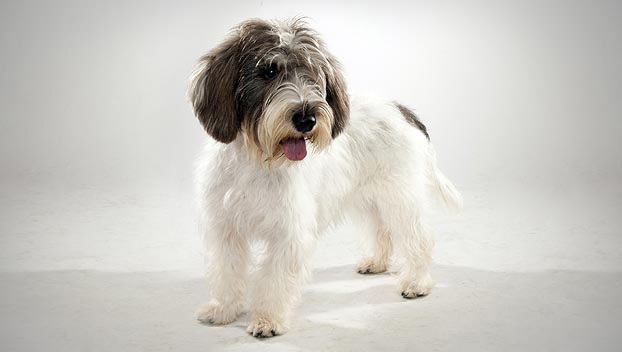 PBGVs are classic hounds dogs, which can make them a challenge to train. They are willful and stubborn and don't like to be told what to do, but like other hounds will do almost anything for a treat. Training should begin early to establish leadership, and sessions should be kept short to accommodate the PBGVs often short attention span. Consistency is important, as they will walk all over a trainer who bends the rules, even once. PBGVs can not be trusted off leash in an unfenced yard. These little guys will take off after squirrels or rabbits and will completely ignore your calls to return home. Even the most obedient PBGV has a one-track mind once he's spotted. Once basic obedience has been mastered, PBGV's should graduate on to agility training. This activity can burn off excess energy while allowing the dog to use his mind, which is important to this thinking breed. Petit Basset Griffon Vendeens are small, but they are active dogs who require vigorous exercise to maintain health, happiness and an even temperament. Daily walks and the opportunity to run and stretch their legs are a minimum. Their size makes them appealing to apartment dwellers, but a commitment needs to be made to exercise your PBGV extensively. 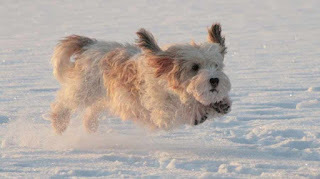 Mental stimulation is also important to the PBGV's temperament. When bored or lonely, they will find ways to entertain themselves, which usually involves destructive behavior. It is important to give your PBGV interesting things to do during the day. Advanced training on the agility course can also help keep their minds active while also providing physical exercise. The PBGV’s rough coat has a harsh texture and a thick, short undercoat. It is long, but not excessively so. The result is a dog with a natural, casual, tousled appearance. The PBGV’s coat needs a minimum of grooming. Brush it weekly to remove any dead hair and tangles, and neaten stray hairs in front of the eyes as needed. Other than that, just keep his ears clean, his teeth brushed and his nails trimmed. He's definitely meant to be a no-fuss dog, but it doesn’t hurt to wipe his beard after he eats or drinks to help keep it clean. And because he likes to dig and run through brush and otherwise get dirty, you may find yourself bathing him on a pretty regular basis. The rest is basic care. Trim the nails as needed, usually once a month. Brush the teeth frequently with a vet-approved pet toothpaste for good overall health and fresh breath. Check the ears weekly for dirt, redness or a bad odor that can indicate an infection. If the ears look dirty, wipe them out with a cotton ball dampened with a gentle, pH-balanced ear cleaner recommended by your veterinarian. You may also have to pluck hair from the ear canals to allow air to circulate and make it easier to remove wax and dirt. 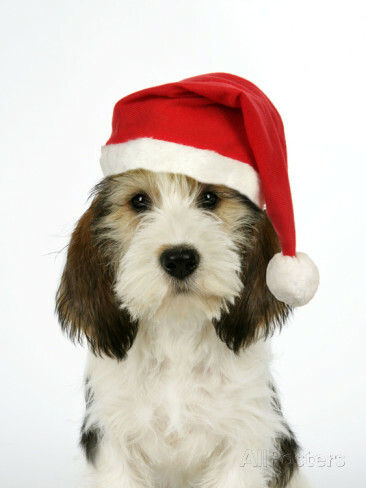 Start grooming a PBGV puppy at an early age so he becomes used to it and accepts it willingly. The friendly PBGV loves children. He enjoys the noise and activity associated with children. Adults should always supervise interactions between children and pets; this is especially important with the PBGV is ensure that gates or doors are not left open, giving him an opportunity to escape. The PBV can be trustworthy with other pets, given proper training and socialization. He especially enjoys the companionship of other dogs. He is a hunter at heart, though, and is likely to chase small animals that run away. Best for families with older children, this breed needs a lot of activity and exercise. Known for hunting and trailing, this dog does best with a house and a fenced-in yard. Although he may do well in an apartment due to his size, he can be loud if he doesn't have enough to keep him busy. Overconfident with a knack for digging, he'll need an owner that provides him with a strict home and good leadership skills. A smart pup, he'll train well and will soon have a desire to please his master. The word “Griffon” is French and is applied to dogs with shaggy or wiry coats. Taken altogether the breed’s name describes him exactly: Petit (small), Basset (low to the ground), Griffon (rough-coated) Vendeen (the area of France where he originated). For short, he is variously called the PBGV, Petit, Griff or Roughie. 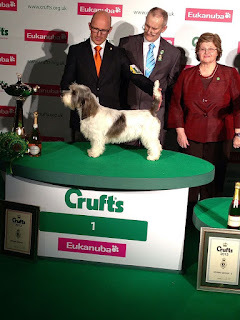 Winner of the world's biggest dog show, Crufts, in 2013, the four-year-old Soletrader Peek A Boo ("Jilly") beat more than twenty thousand dogs to take the coveted title. She won the Hound Group on the first day of the show and then proceeded to win Best of Show on the fourth day. Jilly was previously Reserve Best of Show at Crufts in 2011. Beginning his day with a sniff around the home, he'll inspect every element of the house before going down to greet his master. Confidently strolling into the kitchen, he'll happily sit in front of his bowl as he awaits his first meal of the day. After a brisk walk, a sniff of the terrain and happily leading his master along, he'll return home to show the family who's boss. Playing with his favorite rope toy and stuffed animal while you're away, he'll go into the yard to dig up the smell of game. After a nap in the sun, he'll know that you'll soon be home to greet and praise him for a day well spent.